There are seven legislative assembly constituency in Kushinagar district for the 2017 Assembly elections. They are 332 Fazilnagar, 334 Hata, 329 Khadda, 333 Kushinagar, 330 Padrauna, 335 Ramkola, 331 Tamkuhi Raj. When Uttar Pradesh assembly election 2017 is getting ready to electios new Assembly, Kushinagar is not anywhere behind in the election heat. Kushinagar District (Hindi: कुशीनगर जिला, Urdu: کُشی نگر‎) is a district of Uttar Pradesh state in northern India. Padarauna is the district headquarters. The district is named for Kushinagar, a Buddhist pilgrimage site where Gautama Buddha attained parinirvana in the 6th or 5th centuries BCE. 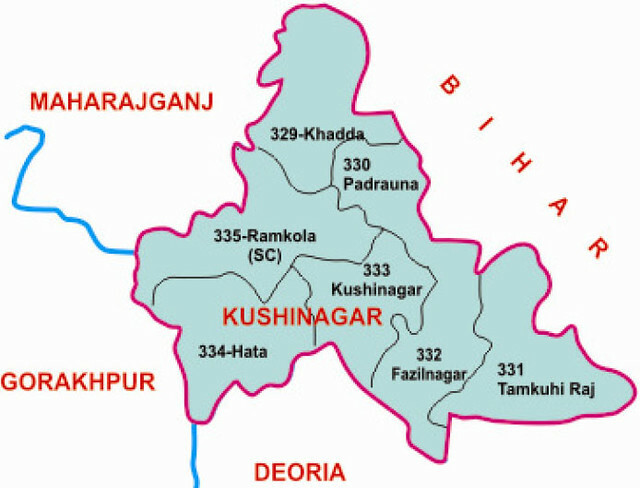 By separating from Deoria district Kushinagar existence on 13 May 1994 (Earlier known as Padarauna and thereafter renamed Kushinagar since 19th June 1997.